I knew I gained some weight. I could see it in my clothes and in the way I felt and especially how I looked in photos, yuck! I hadn’t weighed myself in about 7 years. It got to the point that I was afraid to step on the scale. My dear friend told me about Brien Shamp’s boot camps and suggested we try the 28 Day Skinny Jeans program. I have always been quite active, but I was in for a real challenge at Tonya’s boot camp classes. At the end of the 28 days, I could see and feel the results, though I still had not weighed myself, and I had made no changes to my eating/drinking habits. I was now committed to the work outs and signed on for 1 year! Once again, my dear friend suggested we try the 10 Day Detox. I was reluctant, frankly I didn’t want to give up my WINE, and I didn’t want to step on a scale. Brien went over everything with us, made some great suggestions, such as, try limiting wine intake to 1 glass of red wine a day. So, with very low expectations, on 10/01/2015, I began the 10 Day Detox. The first step was to weigh myself. 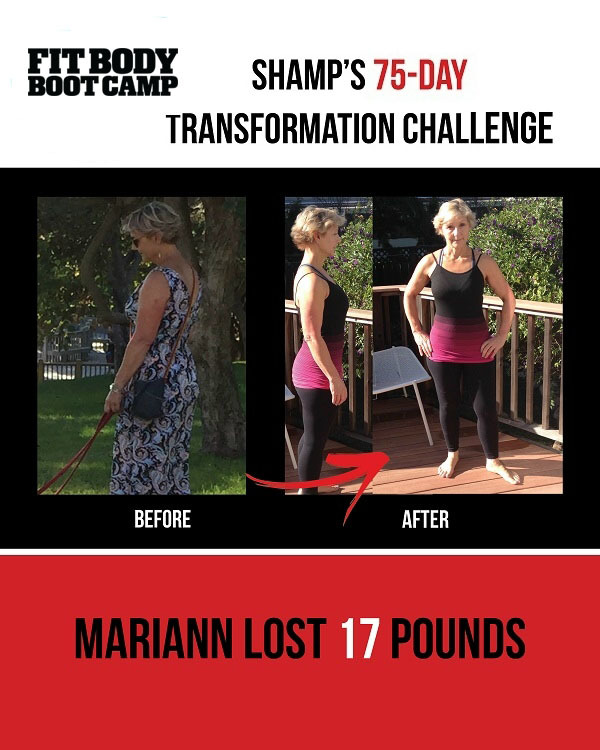 I stepped on the scale and saw that within the last seven years I had gained over 20 lbs. I wasn’t shocked, I knew it was going to be at least that bad. Now I felt as if I had a direction, a goal. I knew how much I had to lose and I had a plan to follow, and Brien and Tonya, and the support of my friends and family to get me through. The goal, 23 lbs by 02/01/2016. I decided that if couldn’t go without for wine for 10 days, there was a problem much more serious than weight gain. The first day or so I missed it, but that craving subsided. At first I could barely choke down the protein shakes, but by the end on the 10 days I looked forward to them! The plan was easy to follow, no crazy food, or exact measuring or weighing. By the end of the 10 days I had lost 4 lbs! Now what? I still had 19 lbs to go. I wasn’t sure how I was going to get through the dangerous time of Halloween through the New Year. Again, my friend suggested we jump into the 75 challenge. At first I said, no way. There was no way I was going to “diet” through Halloween, Thanksgiving and all the Holiday celebrations. Brien explained it is a way to keep yourself in check. Only 1 Halloween candy, instead of the entire bowl. On Thanksgiving, start with eating salad, veggies, and white meat, so you’re not so likely to over eat the stuffing and potatoes. Holiday parties, 1 cookie, 1 cocktail. Make sugar, carbs, alcohol the exception, not the rule. So far I have lost 16 lb’s since beginning the 10 day detox. I feel great. It’s so nice to fit into clothes I haven’t been able to wear in years! I haven’t missed a holiday get-together or celebration. I don’t feel the least bit deprived. I eat healthy foods, make good choices and I now see and feel the results. I still have 7 lbs to go to reach my goal weight, and I am confident that I will achieve it. Thanks to Brien, Tonya, the programs and myself, I got this!